While I know that Fall Through the Cracks Friday is a catch-all of everything you might have missed this week, I saw this and just had to post it. There is no insurance message. There is no business message. There is just this giant eyeball…and a mystery of where it came from. Carli Segelson, spokeswoman for the agency, said the eyeball is slightly larger than a baseball and presumably belonged to some kind of marine animal. “We’re hoping to determine what kind, but at this point we just don’t know,” Segelson said. 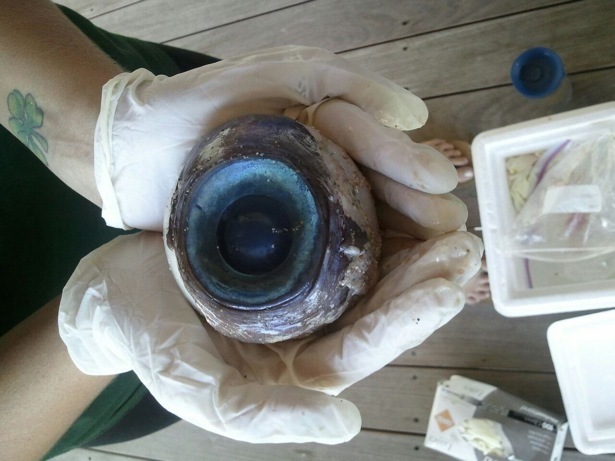 The eyeball is being preserved and will be delivered to the agency’s research lab in St. Petersburg, where it’s hoped an official identification can be made. Meanwhile, people are making all sorts of guesses. Perhaps the best comes from George Burgess of the Florida Museum of Natural History. Burgess has suggested that the eye may have belonged to a bigeye thresher shark. The species is found off Florida in moderately deep water, and the sharks are aptly named. I don’t know what creeps me out about this more…the fact that giant eyes are washing up on the beach, or that the experts only “presume” that its a marine animal. This entry was posted in FTTCF and tagged Creepy, Not Halloween Yet by plushq. Bookmark the permalink.